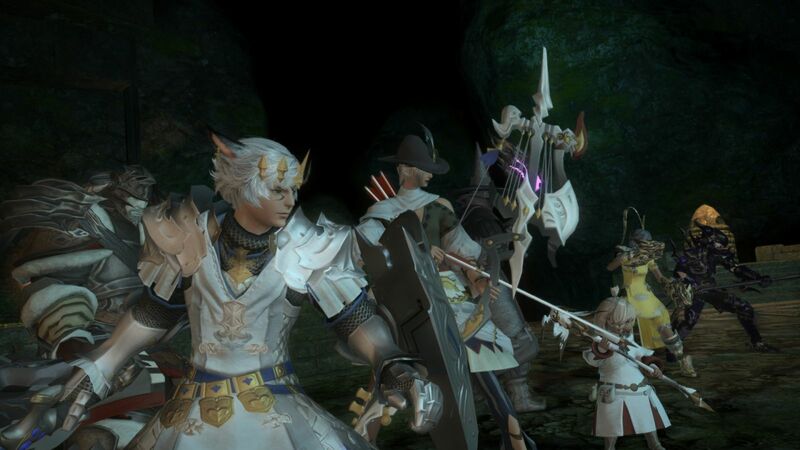 In late February, a reddit thread exposed a strong exploit in FFXIV in the community. The Ungarmax Limit Break allowed players to increase their damage output for a short time with a simple chat command. The exploit was so bold and so conspicuous that many wondered: How could that slip through? And why was the exploit not resolved immediately after it was reported? Now the director of FFXIV Naoki Yoshida comments on the incident. In a surprisingly transparent post, he explains how the glitch came about and what is being done about it. The penalties for the exploiters are also listed exactly. Originally the exploit was implemented in October 2017 together with the content patch 4.1 in the game. To gain access to this NPC limit break, players first had to unlock the NPC Command stakes. It consumes only a limit bar of a maximum of 3 possible and can be used several times in boss battles. It increases the damage output of the group by a whopping 50% for 15 seconds. The duration of the effect can be increased to 25 seconds by the Opposition ability of the Astrologer job. For a single player up to 40 seconds. Some time after the release of the 4.1 content patch, players found that Ungarmax could also be used outside the designated instances using a chat command. Some players used the strong buff effect of the limit to master the toughest raids in FFXIV. When the exploit attracted much attention by a Reddit post on 27.02.2017, several players claimed that they had reported the glitch to the GM team several months ago. In order to determine how the error has come about and whether he has actually been reported multiple times, appropriate investigations have been initiated. The investigation has shown that a player for the illegitimate use of the NPC limit break was actually reported several times to the GMs. A special team, the Sonderkommando, has started watching the player. However, since no use of third-party programs was detected, the observations were discontinued. The glitch remained undiscovered, as the Sonderkommando had specialized too much in the fraud by third-party programs and Botting. The error itself was absolutely trivial: In the case of Ungarmax the security on the part of the server was missing. It is a routine check that takes place using all abilities and checks their legitimacy. The chat command that triggered Ungarmax was not controlled by the server and could therefore be used outside the designated instances. Blame for the mistake, the director of FFXIV sees in himself and the development team. Thus, he said, certain minimum standards and routine development processes were not respected. In addition, some team members were not properly informed about the need for the server-side check. To prevent such an error from occurring again in the future, bug reports of this kind will be examined in more detail than was the case until now. In addition, the QA team will revise its guidelines to ensure better reviews in the future. Basically, none of the GM teams to specialize too much and thus missed the bad reports such as Ungarmax. And what happens to the cheaters? Until midnight (JST) on February 27, "Ungarmax" was used by 25 characters from 21 accounts in 8-player content. After midnight (JST) on February 27, "Ungarmax" was used by 1110 characters under erroneous circumstances. The investigations showed that the owners of the 21 accounts used the chat command several times outside the intended content. In addition, they have kept the exploit secret from other players in order to gain an advantage. Most of the 1110 characters who tried the exploit after the announcement used it mostly in public areas or in instances where they could not take advantage of the buff. These players, who have only used it "out of curiosity" once, do not need to fear any punishment. How Yoshida will act against the other players is still unknown. This kind of transparency about internal operations at Square Enix is rare and has been well received. Following this, the director apologized to the players for failing to do so and specifically asked for glitches like Ungarmax not to be used as it violates the game's rules. For more FFXIV tips and tricks, stay tuned to FFXIV4GIL. You can choose www.ffxiv4gil.com where you can buy Final Fantasy XIV Gil cheap.